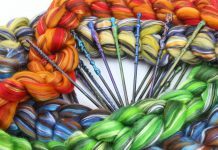 Home Staff Picks What To Do With Scrap Yarn? If you are anything like me, you have a TON of scrap yarn left overs from projects. I love sock knitting and have tiny little feet so I always have yarn left over from my sock projects. I store the scraps so I balled up the bits and bought a large glass fishbowl to store the scraps. 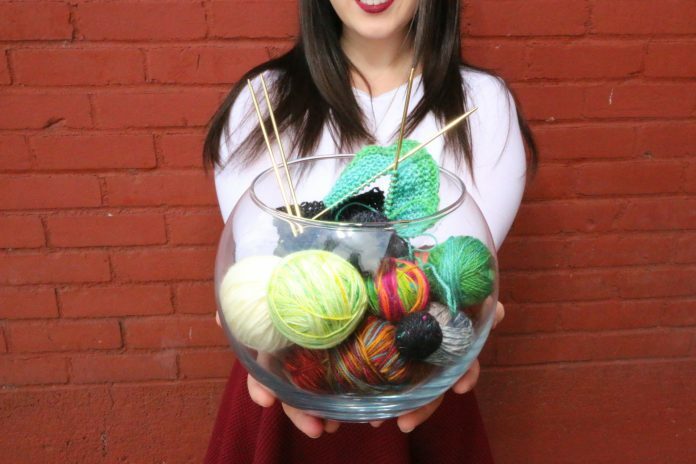 Now it looks like yarn candy in a bowl and while that is beautiful, I really needed to do something with them. The question is, what to do? Here are a few ways I like to use up those scraps so they don’t go to waste. Watching Youtube knitting podcasts such as Little Bobbins Knits, Legacy Knitz, and Grocery Girls has really helped me get an idea of how to use up my scraps. 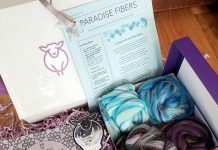 I love watching knitting podcasts to get an idea of what projects and yarns other people are working with and these are some of my favorite. I highly recommend you check them out! Watching these lovely ladies’ podcasts feels like you are in a knit group without ever leaving home. 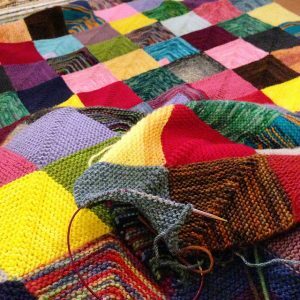 Lately it seems like everyone in knitting podcasts are making either the Cozy Memories Blanket or crocheting the Granny Stripes Blanket to use up all those colorful bits of yarn. I just started making a cozy memories blanket and although I know it will take a long while for me to complete, at least I know all my scraps are being put to use. 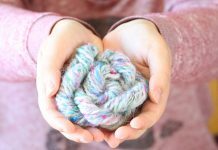 I am really enjoying seeing my handspun yarn being knit up and feeling the pride of putting yarn I created into a treasured blanket I will have for years to come. What About the Tiny Scraps of Yarn? 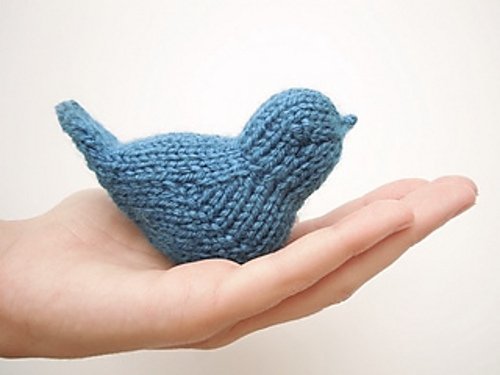 For all my tiny scraps under 20 yards, I have been making the Bluebird of Happiness pattern which is the cutest little knit bird that makes perfect cat toys or key chains. Many of my friends have cats so whenever I have a tiny bit of yarn left over, I make these little birds and the cats love them. Especially when I fill them with cat nip! I also really like the Bunny Nuggets pattern and since Easter is coming up soon, I think it would be such a cute idea to have all these little bunny nuggets around the house as Easter decorations. 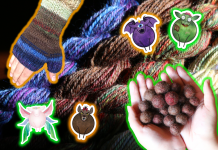 They are perfect for even the tiniest bits of yarn leftovers. Another fun holiday idea is to make Christmas tree ornaments. The traditional colors for Christmas is the classic red, green, and white. However, I really like to have all kinds of color on my tree and make it as bright as possible. Looking at the hand knit ornaments on the tree remind me of the memories I’ve made from previous projects and fills me with pride. You can use scrap yarn from a small bit to make little ball ornament all the way to making an ornament the size of your head! Some fun tree ornament patterns are the Tiny Sweaters pattern, Christmas Bauble pattern, and the Deck the Balls pattern. All these patterns are super fun, super easy, and quick to knit which is good when you just really need an instant gratification project. I have started making one Christmas ornament every month this year so I can have some new fun little things to hang on my tree at the end of the year to remind me of all the projects I have completed. I hate to throw away any little bits of yarn at all. So much in fact that I even save all my bits I snip off after I tuck in the ends of my completed projects. I keep all my snipped ends in a little zipped bag and use them to stuff toys I knit for my nieces. I recently made the Nilla the Unicorn pattern for each of my nieces which was so much fun to make. 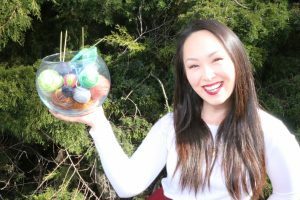 That was my absolute favorite thing I had made all year last year and the kids loved them. They are two and four years old so they are at ages where I am making a bunch of stuffed toys for them. I love being able to use up all my little ends instead of having to run to the store and buy some polyfill. Whether you are making a blanket, decorations, or little stuffies, scraps always have a use. 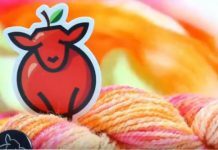 There are a ton of scrap yarn projects out there and a million ways to use them. It all adds up and in the end can make something beautiful, useful, and makes us feel accomplished. So whatever you do, don’t throw away your scraps. You never know when you will need a little bit of that yarn.